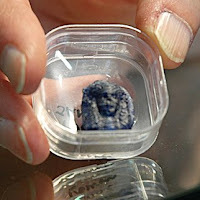 Can you see the tiny face in this ancient bead? 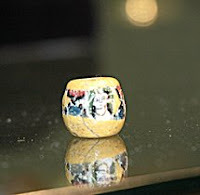 And the God face in this bead? You wouldn’t know the country is in a recession by the buzz at the Bead Society of Los Angeles’ Bead Bazaar this past Saturday. People were cramming the aisles and fighting (politely of course) over strands of beads. I felt like I was at a bargain basement sale! The Bead Bazaars are held twice a year in April and October. With almost 100 vendors at each Bazaar, these events have become famous in Southern California. The event is a fundraiser for the Bead Society of Los Angeles, and is the main source of funding for the many projects of the Society supports. This year, a few of the highlights included the booth for Ancient Beads and Artifacts with rare coins and a few extremely rare beads; some valued up to $3,500. Owner, Bassem Elias was friendly and passionate about his wares and it was a pleasure meeting him. I bought some ancient coins which I plan to build into some rings and necklaces. I’m already excited about how great I know they are going to look! On the other end of the spectrum, but equally gorgeous was the colorful booth by Class Act Designs which sells beautiful handmade and hand dyed silk ties for incorporating into artisan jewelry. I met co-owner Judy Solomon and was entranced by the stunning colors of their silks. I’d love to take a class one day on ways to weave these silks into my pieces! It was a great event and once again, I left with less money in my jeans, but lots more sparkle in my life! Next post: Julie Glassman: Extraordinary Enamels!